Google has finally taken the long awaited dive into the popular growing market of tablets with the announcement of the Nexus 7 tablet and has made a big splash doing so. Google has teamed up with computer hardware manufacturer Asus to design the first Google branded tablet. For Google fanatics, this is incredibly exciting news. Google has been the long time dominator of web search and is now beginning to take over the tech world with operating systems, mobile platforms, web browsers and now tablets. The Nexus 7 tablet comes with some stacked features and tech specifications at an amazing price. The Nexus 7 will start at the shockingly low price of $199.00. The Google Nexus 7 comes with a beautiful 7” high definition touch screen display with scratch resistant glass by Corning. This vibrant display will optimize the movie watching and game playing experience for all users. Typically, vibrant and high resolution displays are the best way to sacrifice battery capacity of any portable device. However, the Nexus 7 comes loaded with a power conserving battery that can handle over 9 hours of HD playback, 10 hours of e-reading and up to 300 hours of standby time. This battery life is ideal to support the massive amount of content provided in the Google Play Store. The Google Play Store comes preinstalled on the Nexus 7 and boasts 600,000+ applications, full HD movies and videos and over 4 million books available for download. Along with this, Google Play offers thousands of free apps and free content specials. For iTunes users, Google offers a music manager that allows iTunes music to be imported into the Nexus 7 music library (excluding DRM protected songs). Also, preinstalled on the Nexus 7 are popular Google applications such as Google Chrome for fast web browsing, Gmail for immediate email access, Google+ to connect and stay in touch with friends and YouTube to access millions of videos at your fingertips. A built in microphone, camera, GPS and accelerometer complete the quiver of features in the Nexus 7.This light and portable tablet has set the bar high for future tablets. The Nexus 7 comes complete with a 1.2 megapixel front-facing camera and weighs only 340 grams making it a versatile tool that can double as its owners tablet and primary camera. Storage capacity is available in either an 8 GB model or a 16 GB model, allowing large quantities of content to be saved. 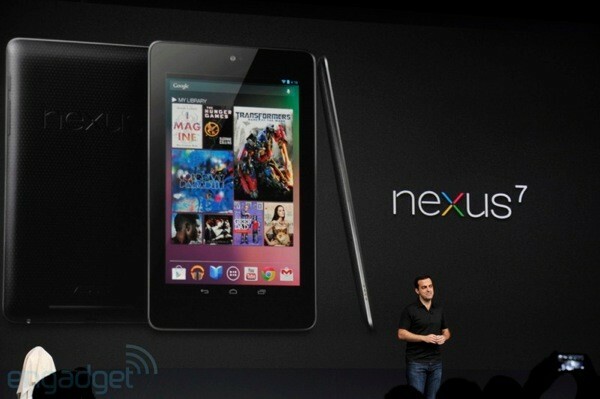 The Nexus comes complete with a NVIDIA quad-core Tegra 3 processor which makes it an elite gaming device. The 1 GB of RAM allows the tablet to run multiple applications simultaneously to provide a smooth and reliable experience. Internet connectivity is supported by WiFi 802.11b/g/n and even Bluetooth functionality for additional wireless connectivity. The latest Android 4.1 Jelly Bean operating system comes preinstalled on the Nexus 7 allowing for optimal performance and an easy to use navigation. The technical specifications of the tablet speak for themselves and they reveal the power hidden within the Nexus 7. Overall, this tablet is looking like it will be one of the best, if not the best, on the market. The Amazon Kindle and Apple iPad already have the first mover’s advantage and both have a firm grasp on the tablet market. However, the technical specifications combined with the tablet features and very low pricing will make the Nexus 7 a heavyweight competitor for the best tablet title belt. The tablet will be available July 31st for purchase.